At its core, camping is about disconnecting, unplugging, and letting the seclusion of nature recharge us. But with advances in technology providing the opportunity to experience modern comforts from the solitude of a campsite, modern camping presents somewhat of a dichotomy. Some campers stick to the bare essentials with an almost religious reverence, preferring to leave behind any hint of modern conveniences. Others have found that access to those modern conveniences is the very thing that allows them to maintain a nomadic lifestyle they’d otherwise be unable to upkeep. Internet access is one of these resources. 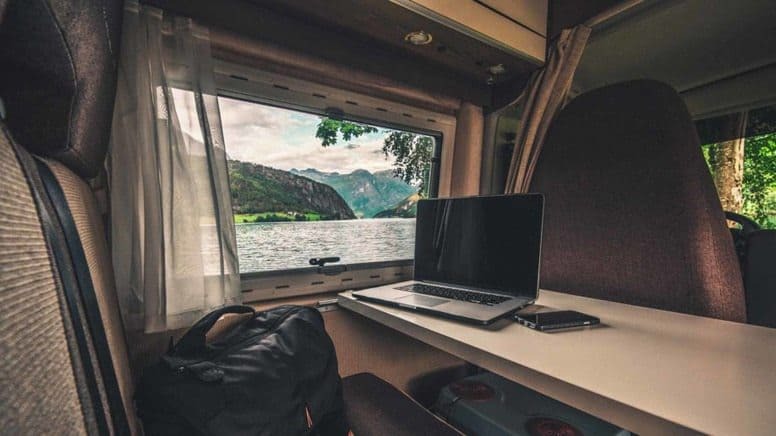 The availability to have remote Internet access in an RV, while counter-productive to some, can open up a lot of doors for others. Being able to work remotely and communicate with the outside world can provide a source of income to fund their ability to live remotely in the first place, making it not only productive but necessary. If Internet has been around so long, why are RVs just now catching up? While Internet access has become commonplace technology, installing it in a mobile capacity presents a slightly more difficult challenge. Ultimately, it’s actually cell phone technology advancements, as opposed to the Internet itself via WIFI, that provides the ability for most to stay connected on-the-go, and through these mobile networks, you can bring arguably the most valuable resource along with you virtually anywhere you’d like to go. The world is becoming increasingly WIFI-friendly, this includes campgrounds, too! With more and more campgrounds touting free WIFI access, and the abundance of other sources of free Internet such as coffee shops, restaurants, libraries, and more, some RV dwellers are finding they can get by on shared Internet access alone. This option comes with its own limitations, however, as these ultra-convenient WIFI networks are often saddled down by poor connections, over-extended bandwidth, and far too many people on-network to run smoothly. Campground WIFI networks are notorious for going down altogether, so while this option may be the most convenient and cost-effective, it’s also the least reliable. If you’re looking for Internet access you can count on, look elsewhere. You’re also limited, obviously, in terms of access. You can’t take a WIFI network with you, so when you’re on the road or camping off-road, you’ll have to go without. This hindrance eliminates this option for a lot of traveling professionals who need to stay connected and in constant communication for work. If you’re looking for a more casual connection to the Internet, and don’t need to rely on that connection to earn income, this is a great, affordable option. 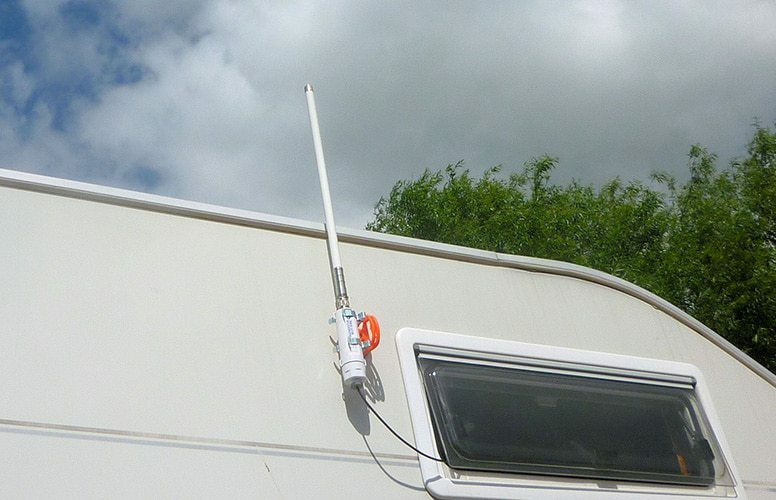 Another alternative option for Internet access in an RV is through a satellite dish. 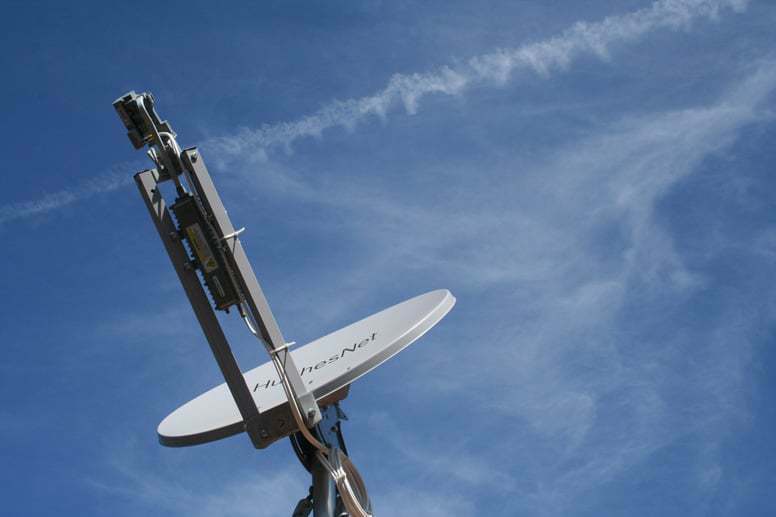 A satellite dish will provide an Internet connection almost anywhere you could want to take it, even in places that don’t get a cellular signal, so long as your dish has an unobstructed view of the southern skies. This option is ideal for those who spend the majority of their time off the beaten path and out of range of cell service but still need a reliable Internet connection. The first major downside to this option is the upfront cost. Satellite dishes and installation have become more affordable than when they were first introduced to the market, but due to other options like cellular service gaining popularity, fewer and fewer companies still offer satellite Internet options. The cost of the dish itself is likely to be your biggest investment, and in that, you have another decision to make. The most common satellite dishes for RV Internet access are roof-mounted units. These are typically the more expensive choice but are extremely convenient to use. 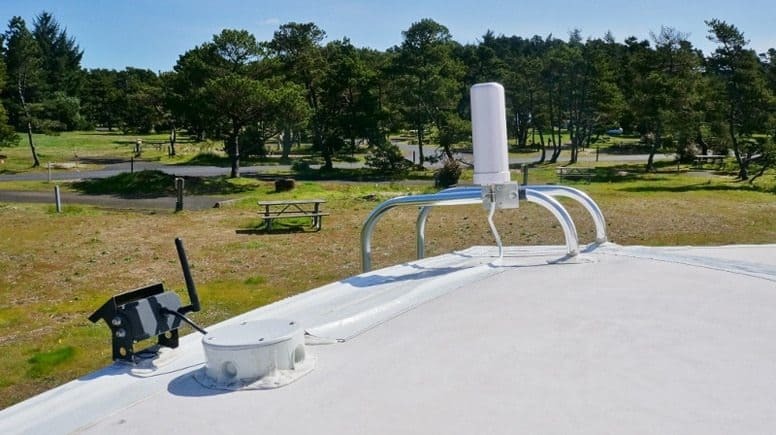 They don’t take up any extra space in your RV since they’re permanently affixed to the roof, and they usually search for the signal and connect automatically. The downside to this is that you are forced to park your RV where your satellite will have a view of the southern sky, somewhat limiting your parking options. Another option is a tripod or stand-alone satellite dish. Although they often collapse or fold up to minimize their size, during transit they need to be stored in your RV, making these the less space-efficient option. On the plus side, they are cheaper than roof-mounted units, and due to them not being attached to your RV, they allow you to park your vehicle wherever you’d like and set up your satellite elsewhere in view of the southern sky. Regardless of the type of satellite you choose to purchase, you should be aware that all satellite Internet connections have their limitations. Your signal is, quite literally, traveling to outer space and back, so you can’t expect the Internet speeds you may be used to with a traditional WIFI setup. These connections are also not private, and during peak usage hours the signals tend to get overloaded and slow down even further. So while the connection itself is quite reliable, the functionality of that connection might disappoint. Unless you’re planning to spend most of your time outside standard cell service areas, this probably isn’t the option for you. Advancements in cell phone technology don’t stop at the devices themselves, but also at their incredible ability to form a stable Internet connection from almost anywhere you’d like. This connection can be shared with other devices, essentially bringing Internet access to all of your devices wherever you might need them. There are a few ways you can achieve this. The first is through your cell phone itself. Different carriers and phones vary in their specific capabilities, some phones can share Internet via USB cables while others can act as a hotspot wirelessly through Bluetooth. Often, this will incur an additional subscription fee or network plan through your wireless carrier, but the convenience of needing no additional devices is pretty incredible. The downside to splitting your phone’s connection is that it often provides a weaker connection on both devices since you’re sharing the same bandwidth that’s typically allotted to a single device. A good way to avoid this issue is purchasing an air card for RV Internet access. An air card is a tiny unit that acts as an Internet-only phone line on your cell phone plan. Sometimes air cards are installed directly into a computer, while other times they are small, USB-like devices that can be easily plugged and unplugged from any computer, providing instant and convenient Internet access. These connections are typically much faster than a shared connection via a cell phone hotspot, and that reliability tends to make this option the winner for people seeking a dependable network connection. Whether you’re sharing a connection from an existing cell phone line, or adding on a new air card line, cellular data will provide Internet access anywhere you get cell service. Unfortunately, as any remote traveler will tell you, that does not mean anywhere. If you’re hunting down truly off-the-beaten-path destinations, you might have to bid farewell to your cell phone signal, and therefore also your Internet. Another downside can be the cost. Upfront, the cost of an additional line or an air card is rather minimal, but the actual usage rates vary from carrier to carrier. If you need a large amount of data, the price can add up quickly, so it’s important to have a good estimate of how much daily data you’ll need so you can pick the best plan accordingly. Alternately, Internet options don’t have to be all-or-nothing. WIFI networks are a great supplementary option for times when you require a lot of data and don’t want to pay per GB. Overall, this is the option most-used by modern RV owners. It works as a compromise between relying on WIFI networks and installing a satellite Internet system, as it provides reliable Internet access almost anywhere you might need it. Still on the fence about whether or not you truly need Internet access in your RV? This might seem like a luxury to some, but the benefits extend much further than convenience. Yes, Internet access does provide a range of modern “comforts” such as online shopping, banking, and entertainment, but it also provides the ability to stay safe and informed in ways that were impossible before. Having constant access to up-to-date weather forecasts can make or break a camping trip. And while avoiding a rain shower seems beneficial enough already, avoiding a more serious weather situation can mean avoiding disaster, injury, and even death. And while this may seem a bit dramatic, cutting off access to the outside world means cutting yourself off from the rescue in an emergency. Even if you’re not in need of a serious rescue, Internet access means access to a database of knowledge that can help you get yourself out of trouble, too. If your vehicle breaks down or you have other mechanical issues, a video tutorial might be able to help you fix your way out. Having access to current road conditions and hazards also might mean avoiding mechanical issues in the first place. If you still cringe at the thought of bringing an Internet connection on your adventures into the wilderness, remember that you don’t have to use it. You can think of an air card as another tool in your emergency kit. Just because it’s there, doesn’t mean you have to use it, but having it when you really need it might just save your life. How would you rate this post? I’m an avid outdoor enthusiast who has gone on several excursions along the coasts and has visited 31 of the 50 United States. One of the most important things to me personally is making the most of each day. I'm firmly entrenched in the middle-class and don't mind at all. My freedom and ability to travel and spend time outdoors are more important to me than working at a desk and putting more money in the CEO’s pockets.If camping and active living is your priority, too, you’ve come to the right place. © 2017 - 2019 Kempoo.com. All Rights Reserved.